BLOG - BETWEEN A ROCK & A HARD PLACE: FIFESTOCK-Strictly Acoustic September! 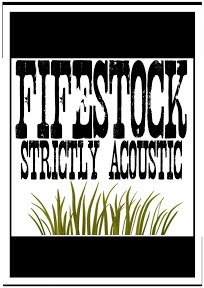 Fifestock Strictly Acoustic is now a reality! Fri 20st & Sat 21st Sept 2013. There will be apprx 15 different Acoustic Artists playing Backstage at the Green Hotel, Kinross each night. All genres and styles this will be great fun. This will become an annual event, so be sure to be a part of the first ever FIFESTOCK STRICTLY ACOUSTIC Festival! For more details please go to www.mundellmusic.com or phone 01577 863467 for Tickets. Looking for something different at New Year? Where have all the Singer Songwriters Gone?